You could say that Moncton’s John Jerome has always gotten by with a little help from his friends. Nowhere is that more evident however than with the upcoming release of his latest musical venture. John Jerome & The Congregation will celebrate the release of their fun, indie-pop debut effort Ask Not What I Can Do For You But What We Can Do Together with a show at Aberdeen Cultural Centre on Tuesday evening. Comprised of Jerome, Kyle McDonald (Shevil, Cop Shades), Julie Doucette (Kevin McIntyre) in addition to Les Hotesses d’Hilaire members Mico Roy and Maxence Cormier, there is a wealth of experience brought to the table by the group’s individual members. Those unique experiences are exactly what Jerome is looking to cultivate and leverage for the group. Jerome, also a member of Moncton groups Pervert and The Great 88, unassumingly started his latest musical venture thanks to a film project that he was working on. From there, the possibility of playing the songs live arose but first, Jerome needed a band. And though it took a period of time to find the right combination of band members, Jerome is downright giddy about what the future holds for the group. 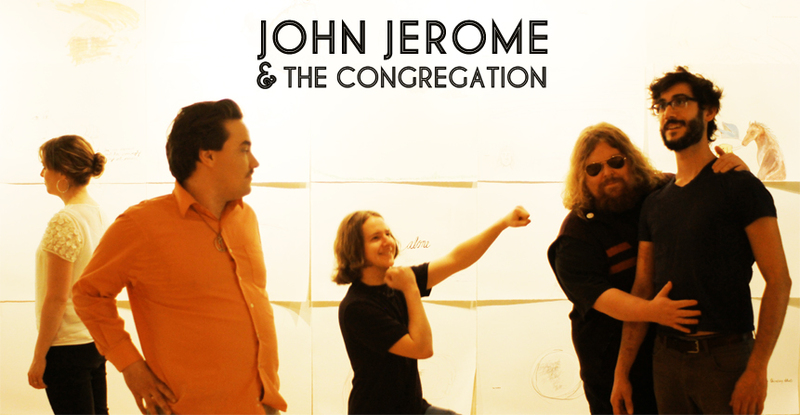 Rather than merely opting to release the group’s new effort on CD and/or digitally, Jerome & The Congregation have pressed Ask Not What I Can Do For You… onto vinyl. For those not equipped with a turntable, fear not; each copy of the album includes an MP3 download card. McDonald says the decision to press the group’s record onto vinyl stems from the fact that the group’s members are all avid music fans and collectors. Jerome & The Congregation are getting set to hit the Trans-Canada highway in support of Ask Not What I Can Do For You But What We Can Do Together. The band has booked an ambitious 26-date tour that will take them from Halifax to Vancouver before the end of April. Booking a national tour at the outset of a record’s release may seem overly ambitious, but the group’s belief in their music and desire to want to bring it to as many bodies as possible is what is ultimately driving them. “Playing music is definitely our passion and as such, we would be doing ourselves a disservice to not seize the moment by bringing our music to as much of the world as we possibly can,” McDonald says. “If it were financially feasible, we would be on the road 200 days a year. That is a goal we would love to work towards. It takes a lot to be able to do this. I don’t believe that the general public quite realizes what it takes to be able to bring your music on tour. People are so used to seeing huge bands come to town playing for big-ticket costs that I think they overlook that unsaid reality of what it takes for the average working touring band to get to their city. Despite Ask Not What I Can Do For You… being newly released, Jerome is already looking forward to the making of the group’s next album. Unlike their debut, which was essentially songs that he brought to his band mates, he foresees the next album being a true group effort.